This year’s Cavendish Christmas Fair promises to be the best yet! Where: Christmas Fair will be run in the main school halls & Santa’s Grotto and reindeers will be taking up residence in the Nursery building. Prices: £1 entry fee to the Christmas Fair and £2.50 to visit Father Christmas (including gift). Tickets are available NOW on ParentPay. You can even book your time slot to visit Santa. Limited number of tickets available on the night. 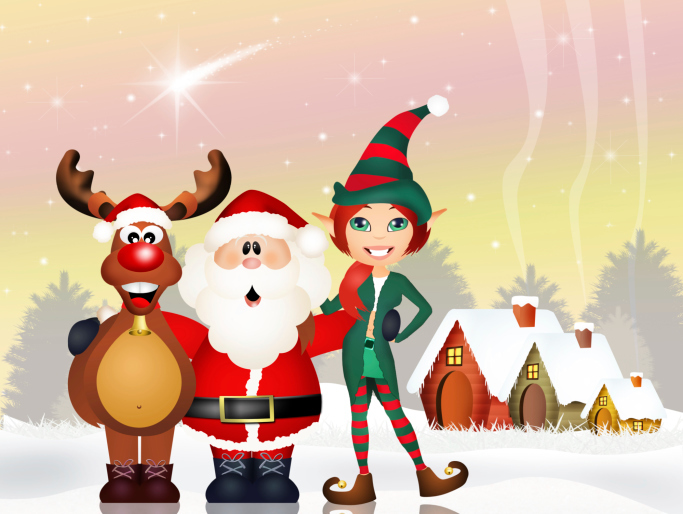 Nursery Building: This year Father Christmas will be joined by his real-life reindeer friends, Rudolph and Blitzen. You can visit Santa in his magical grotto and stop by to say hello to the reindeers – even have your photo taken with them! It promises to be an enchanting experience for children and parents alike! Open 3pm. School halls: We’ll be hosting a number of Christmassy stalls with hand-made goodies from the children as well as the usual drink and chocolate tombola, lucky dip, festive face painting and gleeful glitter tattoos. There will be lots to keep everyone entertained with make-and-do craft stalls and jolly games…so get ready to pin the nose on the reindeer! The staff room will also be hosting our first Christmas café so you can take time out from the hustle and bustle and indulge in some festive drinks and treats. Open 3.30pm-5.30pm. The Grand Raffle winners will be drawn at 4.30pm and if you haven’t bought your raffle tickets yet then take a look at the Grand Christmas Raffle webpage. We’ll also be selling tickets during the Christmas Fair so make sure you bring your spending money. If you’re planning to have a clear out of toys and books before Christmas then please consider donating them to the PTA. Our second hand Toys & Books stall is always popular and helps us raise money for the school. If you have items in good condition, simply drop off at the school office….but please no broken toys or jigsaws with missing pieces!! Friday 27th November – non uniform day in exchange for a donation to the chocolate tombola. Friday 4th December – non uniform day in exchange for a donation to the bottle tombola. We’re looking for extra elves to help us set up and/or help out on the night. If you have any free time between 9am and 5.30pm on Friday 4th please email volunteers@cavendishpta.org.uk – lots of hands make light work and we want this Christmas to be extra special.